The human ear is capable of hearing very quiet (low intensity) sounds and extremely loud (high intensity) sounds. The ratio of intensities between silence and ‘oooow, that hurts my ears’ is about 1:100 million million. 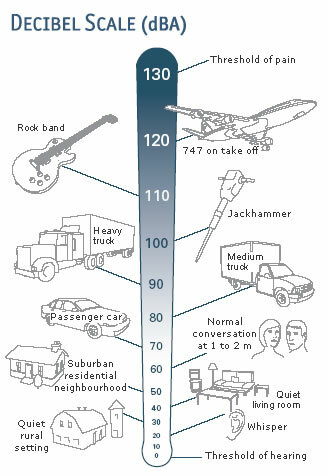 It makes things easier if a logarithmic scale is used, called the decibel scale. In decibel terms, a doubling in loudness corresponds to an increase in 10dB. It doesn’t matter whether that increase is from 10dB to 20dB or 100dB to 110dB. 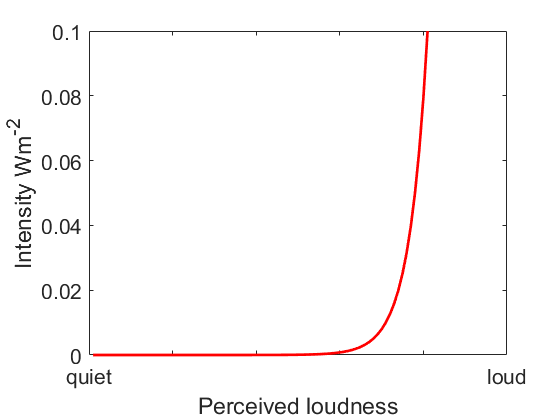 In the graphs below, the x-axis represents the perceived loudness of a sound, and the y-axis represents the acoustic intensity needed to create that loudness. To make a sound twice as loud, you need to multiply its intensity by about 10. So an intensity of 1,000 is twice as loud as an intensity of 100. An intensity of 1,000 is also half as loud as an intensity of 10,000. Our ’10x’ rule means that as the overall level increases, we need increasingly large changes in intensity to get a similar change in loudness. The plot is a curved line. On the next graph below, a logarithmic decibel scale is used and now the curve becomes a straight line. 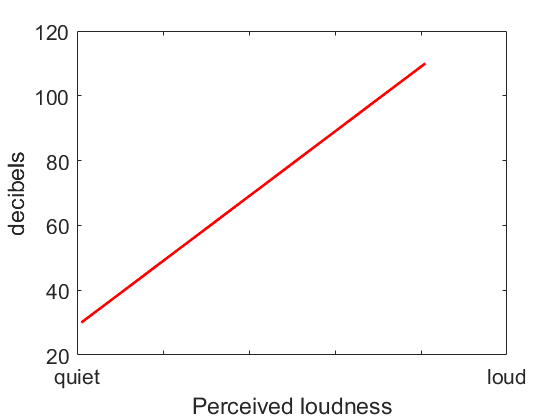 The relationship between perceived loudness and the decibel is a straight line. The decibel is a better fit to how our brains perceive sound. We need to get familiar with the idea of a logarithm. Just about every piece of audio equipment (microphones, loudspeakers, sound cards, amplifiers, mixers, etc) will have specifications expressed logarithmically (i.e. in dBs). A decibel value is therefore based on the logarithm of the intensity of a sound. The quietest sound the average person can hear has an intensity of about 1 picowatt per square metre (1 x 10-12 W m-2), and this is defined as the reference intensity level which is equivalent to zero decibels (0 dB). Here is an example. A sound has intensity of I = 1 W m-2 , what is the level in dB? Note, the decibel has a times ten outside the logarithm. What happens when I is the reference intensity of 1 x 10-12 W m-2 ? #1 Which is the transverse wave? #2 Which of the following is a transverse wave? #3 A sound generates an intensity of 0.5 W/m^2. What is the intensity level in dB?